As you might have heard, on the 22nd of October we will start to see the first deliveries of the T-Mobile G1, the first phone based on the Android mobile platform. This is an incredibly exciting time for us, the culmination of over three years of work done by hundreds of people at the companies that make up the Open Handset Alliance. All of us are waiting with bated breath to see how the phone is used and what its impact will be on the future of mobile phones and computing. Today I'm very proud to announce that we are releasing the code that went into that same revolutionary device. Let me present Android: the first complete and highly functional, mass market, Open Source mobile platform. Built with and on top of a bunch of Open Source software, this is one of the largest releases in the history of FOSS. Our goal was to make millions of terrific phones possible, to raise the bar on what people can expect from any mobile phone and to release the code that makes it possible. So check out the code, build a device, send in some patches and become a committer. Android is terrific now, and with every new developer that joins us Android gets better. Not just for the Open Handset Alliance, not just for Google, and not just for T-Mobile G1 users — but for everyone. Through the use of Open Source we can change how the world thinks of cell phones and portable computing, together. 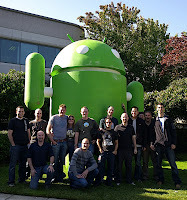 If you'd like to know more, visit the Android open source page and read all about its debut there.